If you play or watch basketball, then you probably already know that it is a really intense game requiring a lot of fast and rigorous moves to play. When you move around the court, your entire body depends so much on your knees to make that jump or that move. Also, the buck stops at your knees when you need to make quick, sudden direction changes at high speed. Knowing this, it’s therefore not totally absurd to find that many basketball players end up suffering different kinds of injuries to their legs and knees. In fact, according to Dr. Ed McLaughlin (Sports Medicine Center), basketball players suffer the most knee injuries when compared to participants of any other sport at all. Still, think knee sleeves and kneepads aren’t big deals for ballers? So, what are knee sleeves? When you suffer a tear to any of your ligaments, whether the ACL, the PCL or the MCL (or even a cartilage), you need to take proper care of it if you intend to return to the court and slam dunk again. One of the ways in which you can care for such knee injury is to use a knee sleeve. However, although knee sleeves provide good support, they must never take the place of proper techniques. A knee sleeve helps to protect the knee from any form of injury. It is also great for knee health as it increases blood circulation around your knee, thereby making the knee naturally stronger. A knee sleeve is not padded, so it doesn’t necessarily prevent knee injuries, it just reduces your chances of getting a knee injury, and the severity of the injury if it still occurs. Kneepads are pretty similar to knee sleeves in that they are also used to protect the knees from injuries. But unlike knee sleeves, they are padded so they can help to prevent knee injuries to a very large extent. So in the case of a fall, for instance, because knee pads come padded, the force coming from the impact of the fall is easily absorbed and a serious injury can be partially, if not totally, avoided. Should an injury still occur, because a player was using a kneepad as at the time of the accident, the healing time for that injury can be cut down very significantly. 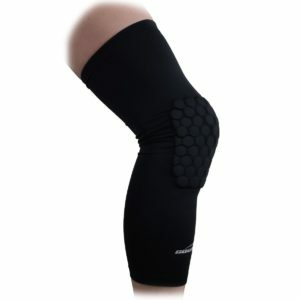 What are the Benefits of Using Basketball Knee Sleeves? Knee sleeves and kneepads form a very important part of your basketball gear. If you want to enjoy playing basketball for as long as possible, then you must get yourself a pair of knee sleeves and knee pads. Neoprene is the material of choice for many manufacturers when making knee sleeves and this is not just arbitrary. Neoprene is an excellent choice for its therapeutic effect on the knee. By providing your knee with warmth and increasing the circulation of blood around the knee, neoprene knee sleeves help to reduce the pain from an injured knee and also increase your level of mobility too. Again, with knee sleeves your proprioception is much increased. Proprioception is the ability of an individual to grasp the relative position of their body parts and the strength of effort they’re applying in movement. In other words, you have a greater consciousness of what you can do in the court when you use knee sleeves. Even though knee sleeves are hardly restrictive in nature, they have the ability to limit the movement of your patella to a small extent. This, in turn, gives you more confidence in your knee’s ability when in the court. What are the Benefits of Using Basketball Kneepads? Kneepads give your knees overall protection by offering a kind of cushioning effect between your calf and thigh. This, in turn, helps to cut down on the strain suffered by your knee joint and its surrounding ligaments, bone, and cartilage. In fact, the Bastyr Center for Natural Health reported that the risk of sustaining a knee injury in high school athletes reduced by 56% when the athletes used kneepads. Durango Orthopedics has also advised that wearing a kneepad during high-impact activities can greatly reduce your chances of fracturing your patella. Kneepads are also helpful in supporting your knees so you don’t overextend them and risk having your knee collapse while you play. Some kneepads come with sleeves that extend to the back of your knees and support the surrounding muscles ligaments while still protecting your kneecap. By connecting your thigh and calf muscles, kneepads protect you from hyper-extending your knee in a game as strenuous as basketball. With kneepads your confidence during play can be greatly increased since you’re certain that however high you jump; or whatever high-speed, sudden moves you have to make, your knees will be safe and protected in the kneepads. They must be properly fitted: You don’t want a pair of knee sleeves or kneepads that won’t stay on your knees and will require you to keep adjusting while running across the court; so ensure you pick a pair of your own size. Of all the factors to consider, the fit is, without controversy, the most important. Make sure you’ve had your knee measured and then compare to the chart before you select any pair. Ease of Cleaning: Get knee sleeves and kneepads that are easy to clean. Some knee sleeves will come machine washable, best for you. At least, that takes away some stress. As for knee pads, finding a machine washable pair might be a bit more difficult when compared to knee sleeves but find something that won’t be a chore to clean because trust us, after a day in those things, you’d cry at the stink. Consistency: Over time, your knee sleeves and kneepads will begin to slack and if that time is just a short period after you purchased them, you will have wasted money on the pads. Aside the fact that it’s an investment wasted, expansion will cause the compression effect to significantly reduce. So, ensure that you pick knee pads that stay true to fit over a long period of use. Basketball knee pads and sleeves are very popular products, which is why they are produced and offered by countless different companies all over the world. There are many different types, styles and even materials used in the production of basketball knee pads and sleeves, as there are different needs and purposes these products serve. The main reason why basketball knee pads and sleeves are used is to protect your knees and joints from acquiring injuries while working out. These knee pads aren’t very padded, as you don’t fall often while playing basketball, but they provide great compression and support, so basketball players can be sure that they won’t injure their knees while playing. You can find our list with the best volleyball knee pads in the table right below. The McDavid basketball leg sleeves are designed for knee and leg protection while playing different sports, which require knee protection but do not demand a lot of knee padding such as basketball and football. Since these McDavid knee pads will not be appropriate and will not provide enough protection for frequent and hard impacts like volleyball players experience often. So, if you are a volleyball player then these knee sleeves will not be the best choice for you. The McDavid basketball knee pads are extremely popular all over the world due to their diversity, as they can be used as leg and arm pads. These basketball knee sleeves are very lightweight as they are made out of nylon and spandex which are lightweight and elastic fabrics, ensuring that your knee pads will feel comfortable and adjust great to your leg, or arm. The McDavid basketball knee pads will not budge and will stay in place, therefore, they will provide complete protection of your knees throughout your activities. The knees, or arms, will be kept safe and warm, throughout the exercise, avoiding any possible injuries, muscle pulls, fatigue and even cramping after the activities. And these basketball knee sleeves have a three inch long extensions on the top and on the bottom of the sleeve for extra support, protection, stability, and comfort. The special Hydra Vent Hdc moisture management system that these knee sleeves have ensures that your knees are always well ventilated, dry and cool, even though the most active of workouts. But, during cold weather, the sleeve will keep your knees warm, so really they are perfect for all seasons. And the Hex Pad technology creates very comfortable knee pad, as it consists of individual hexagon shaped pads, which perfectly conform to your body and legs as you move. 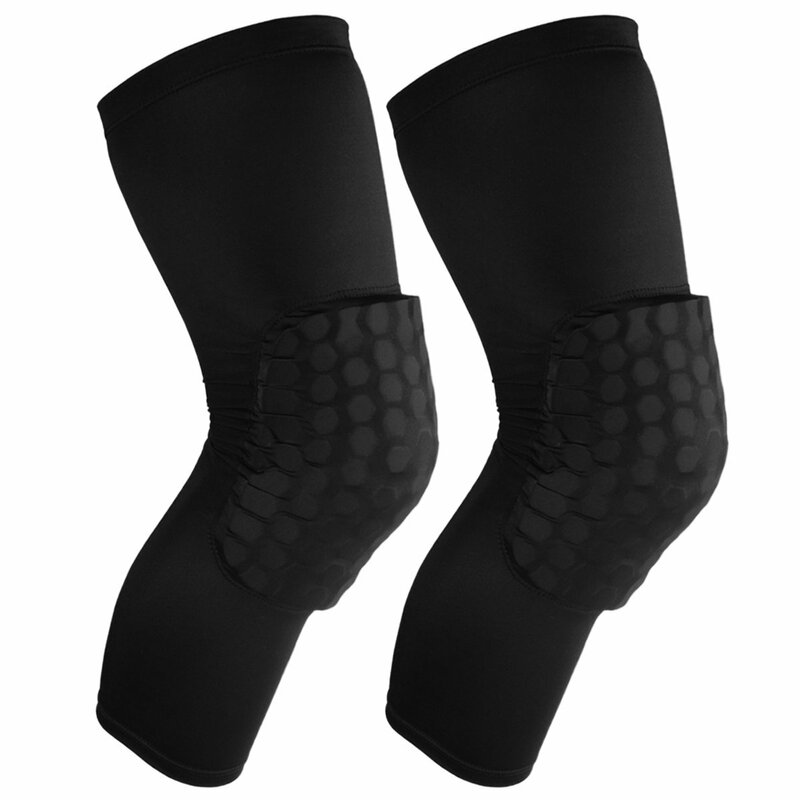 The design of these basketball knee pads is modern and simple, as you can easily wear them underneath clothing as they are not extremely padded. And lastly, the large variety of colors (black, white, navy, scarlet, royal, gold, gray, orange, pink, purple, Carolina blue, charcoal, dark green, Kelly green, light pink, maroon and Texas orange) provides an option for any customer preference. The manufacturer of these basketball knee pads is a worldwide company called Viper, who produces high-quality athletic products. They have gained their popularity among customers because of the attention which is paid to every little detail when designing and producing their products, as they are high-quality, durable and very comfortable. And many athletes choose the Viper knee pads for basketball because of their protection and effectiveness which has been acknowledged by many professional athletes. 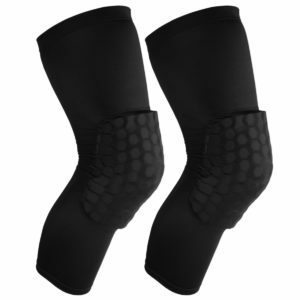 The Viper basketball knee pads are only sold as singles and don’t come in pairs which will be pricier and more inconvenient when you are in need of a pair, but it can be a better option if you are in need for only one knee pad for replacement. These basketball knee sleeves are designed using Hyper Flex technology, which ensures that your knee pad stays in place and conforms to your knee and leg during activities, even while running, bending, jumping and stretching. In addition, the Viper basketball leg sleeves have a dual-layer Tru Core wicking system, which keeps your knee ventilated and dry, and also, warm in cooler weather. So no matter in what weather conditions you are exercising, your knees will have the right temperature and will be kept either well ventilated or warm. The design of the Viper basketball leg sleeves is very modern and still carefully thought out. The inner silicone strip ensures that the sleeve won’t slip around during actives, as the last thing you want to concentrate while working out or playing sports is your knee pad sliding down and dislocating. 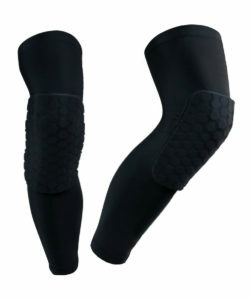 They are also very durable and extremely comfortable so you won’t experience rips and tears in your knee sleeves often. 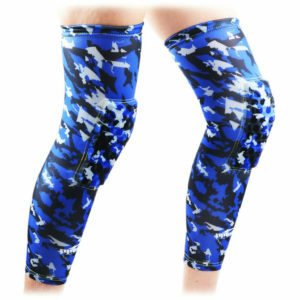 But, even though these basketball knee sleeves have several sizes which are elaborated in detail below, you might want to order a size up, as they tend to run a little small. Also, as the basketball sleeves are made out of neoprene and silicone they aren’t as stretchy as similar pads that have nylon in their structure, which accounts for the stretchy feature. Ecourban Company is an internationally recognized company which specialized in providing athletic and outdoor gear and accessories for customers in different parts of the world. They use the latest innovative technologies and the highest quality materials in order to achieve the best and most efficient results. The Ecourban knee pads for basketball assist each movement of your leg and knee, providing gentle support, in order to avoid any injuries, sprains, and dislocations. 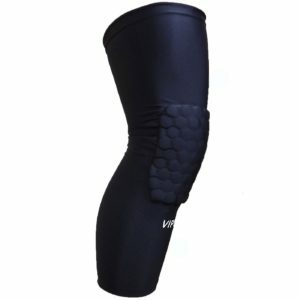 They have introduced a specially designed contoured knee pad which surrounds your knee to provide all around protection. During any movement of the knee, the pad and sponge fabric used in manufacturing of these pads will protect the connective tissue and muscles in your legs and knees. Overall, these knee pads are specially designed to not only protect your knees and legs from impacts and falls but also to reduce the risk of any fatigue, soreness and muscle pain after or during activities. 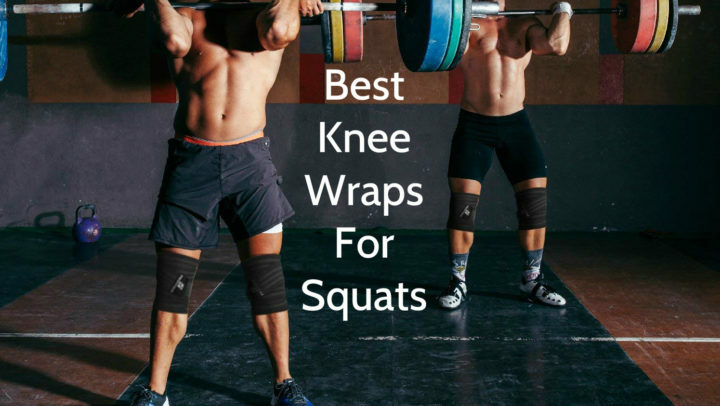 They have also added a moisture management, antibacterial and sun proof protection to the knee pads, which is great for outdoor activities and exercising as well as for very intense workouts. The pads are breathable and lightweight so won’t be bothering you very much during activities, great for running and endurance activities, competition and even longer races. Also, the Ecourban knee pads for basketball have a special vibration and oscillation reduction design, which helps with the overall protection from different strains, fatigue, and even shin splints. Improving your overall performance during training sessions and competitions. Although a specific size chart is provided for these basketball knee pads, there might be a small measurement error, 1 – 2 centimeters. And also you might receive slightly different color as seen online and in pictures, as color shows up differently on different screens. And even though the materials used in production are high quality and ensures great ventilation, they are a bit fragile, so if you choose a size too small for your knees, the basketball sleeves might experience some tearing and ripping. The manufacturer Ace List produces protective basketball knee pads. They produce many different products, home devices, sporting and active leisure gear and accessories, including knee sleeves and pads, and many other types of products. And even though Ace List are versatile and provide products in different fields, they are able to offer high-quality products which are enjoyed and acknowledged by many customers all over the world. These knee pads are a combination of both knee sleeves and pads, as they have the protective and supporting features of both. You can use the Ace List protective basketball knee pads for protection against different impacts and blows while exercising, playing sports and even gardening and doing labor work. Also you can use these knee pads for basketball to provide support for muscles and knees whilst exercising or just doing your everyday life. And these knee pads will be great even for people who have gone through knee injuries and different knee surgeries, and to whom knee support is a crucial part of recovery. These pads are a two in one product, as they are protective and supportive. And you can decide what size knee pad you need not only in circumstance but also regarding length. There is a knee pad which covers only the knee itself and a knee sleeve which is longer and goes up to your tight and shin. 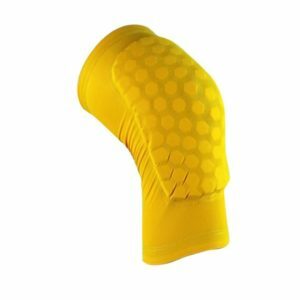 The padding for these Ace List basketball knee pads is made from a honeycomb-like hexagon pads which ensure that you receive an overall support, which is evenly distributed over your knee. This honeycomb-like padding also makes sure that the foam does not gather in one spot and movements aren’t as restricting, as they would be with one whole pad. And the fabrics used in the production of the Ace List basketball leg sleeves make the compression and overall wear more pleasant and comfortable. As already mentioned, the Ace List basketball knee pads are a combination of knee pads and knee sleeves, because they are padded and long, providing protection and support. Although there is only one color design available, it isn’t a huge disadvantage, as the offered color is popular among many people, which is black. Also, you can easily wear these basketball knee sleeves underneath clothing, as they are very discrete and won’t be noticeable. As already mentioned there are two types of knee pads short and long ones, and altogether there are six different sizes of knee pads for you to choose from. Which means that there are three sizes of each type of basketball knee pads. 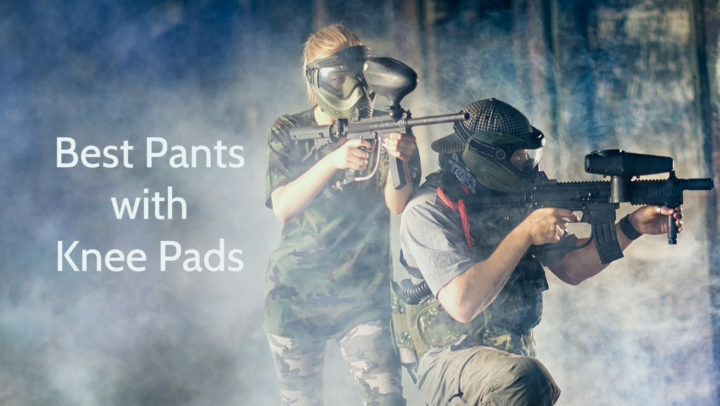 The Coolomg knee pads for basketball are not only perfect for basketball but are also great for other sports and activities, like volleyball, wrestling, dodgeball, paintball, softball, tactical sports, hockey, snowboarding, weightlifting and simple workouts. On top of that, they are great for many outdoor sports, like mountain biking, hunting and even for gardening. The pads are easy to maintain and take care of as you can wash these basketball knee pads in the washing machine, but it is advised to do so in cold water and to air dry them afterward. The Coolomg knee pads are intended to reduce possible injuries and help you with knee pain while you are being active, as they increase the blood flow and circulation in your knees and thighs, helping your muscles recover from any injuries and from any general soreness faster. 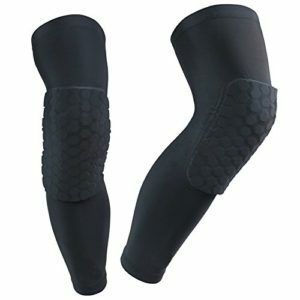 The knee pads for basketball are sold as singles not as a pair which can be an advantage and a disadvantage, as you will spend a lot more money if you need both knee sleeves, however, if you need to replace broken pad or you need knee pad for only one leg, this Coolomg knee pad will be more convenient and cheaper. These knee pads that are often used by basketball players are designed from a soft and elastic polyester fabric, which feels very comfortable and will not be restricting on your legs. And the special design and the materials used to minimize the possibility of tear will make sure that your basketball sleeves will last you a lot longer than most other products. Overall, the Coolomg basketball knee pads are great for general workouts and if you are recovering from any trauma or soreness. Their special design will make sure that the pain levels are as low as possible and your knees feel comfortable. The great air circulation will make sure that your knees aren’t too hot and sweaty, but the materials used in the making of these pads will keep your knees warm during cold weather. Many different sizes are available for customer convenience and even more color options are available. Color options – black, white, blue navy, black gray, green black, orange black, red black, camouflage gray, digital gray, pink black, UD flag red blue, yellow purple, yellow, purple, orange, dark blue, light blue, pink, fluorescent green, rose red. Manufacturer Reach is an international company, which offers a large variety of different knee pads and other personal items like utensils for the kitchen. They also sell many gadgets and technical accessories for cameras. These Reach basketball knee pads are made with high quality materials and are designed to be long-lasting, lightweight and very comfortable. 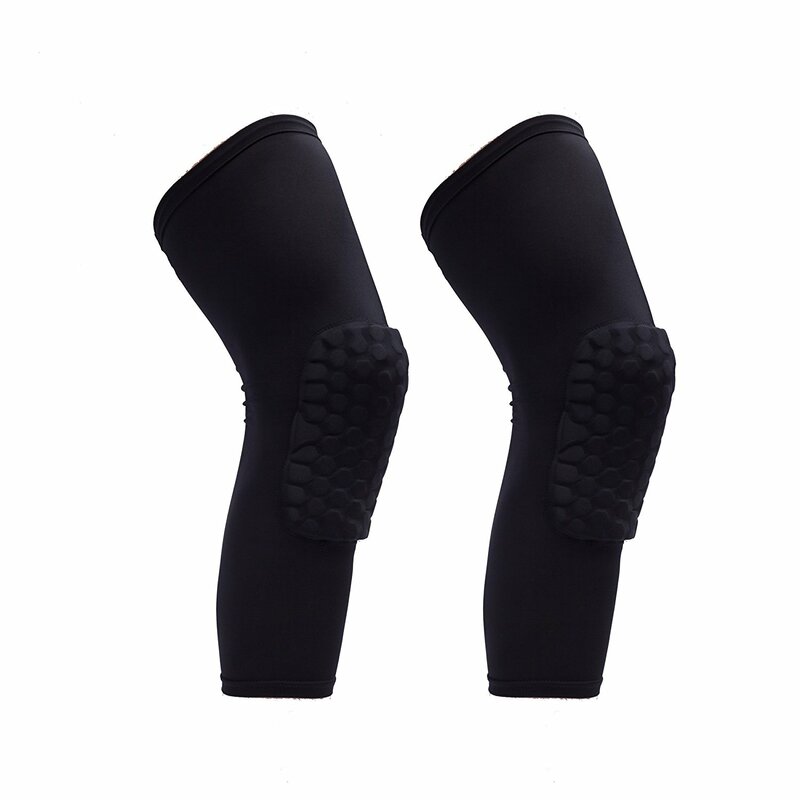 The material used in the manufacturing of these basketball knee pads is elastic polyester, which ensures that the knee pads basketball players’ use are stretchy enough so they can be easily put on and taken off. Their design ensures that the basketball knee pads stay on and aren’t sliding down your leg and changing the place. As it can result in serious injuries. The Reach knee pads for basketball are an excellent choice if you are in need of protection not only against force but also for your muscles. The special design of separate hexagon shaped pads make sure that your knees are completely protected against impacts, but also providing stability and protection for muscles. The material is breathable and well ventilated, so your knees don’t get too sweaty and overheated. They come in a pair of two, and in four different sizes. There are also altogether six colors to choose from – black, blue, purple, red, white and yellow. But, when ordering the knee pads you have to be a little bit careful with the sizing, as these knee pads can run a little bit small. That is because they are manually measured, so the size difference can be from half an inch to a whole inch. Therefore, it is advised to order a size up. The Morris basketball knee pads are sold in pairs. They are made out of high-quality polyester fabric, which is lightweight, smooth and elastic, making the knee pad comfortable to wear and adaptable. 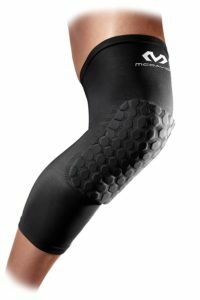 The special design of the Morris basketball sleeves, that uses the unique hexagonal honeycomb design, will protect the knee and your leg around the knee and will provide the necessary stability. And the polyester fabric is breathable used to make these pads will ensure that your knees are well ventilated and don’t overheat. The Morris basketball knee pads successfully protect your knees against various impacts and at the same time provide comfortable and easy wear. And the special anti-slip band installed on the Morris knee pads for basketball make sure that they don’t come off during activities. But, even though the sizes are specified, you might experience a manual measurement errors, which can be from 1 to 1.5 inches. Also, the color in the pictures might be different to the one in real life, as it is hard to digitally show the true color. So just keep in mind when you buy these knee pads. The Actpe basketball sleeves are available in two different colors – black and white. The material used in the production of these knee pads for basketball is high-quality polyester, which is soft and at the same time elastic, clinging tightly to your leg and keeping it secure. The special honeycomb pad design that these knee pads have makes sure that your pad is protecting your knee from all sides and that the protection is evenly spread. Additionally, As the anti-slip band ensures that your basketball sleeve is not slipping down and changing place, so you can wear these pads without worrying about them slipping around and not efficiently protecting your knees. The Actpe knee pads for basketball players are a top choice because they are not only very comfortable, but they are also breathable and elastic. So your knees won’t overheat and become very sweaty throughout the activities. And, these basketball knee sleeves will not only protect your knees from impacts but also keep your muscles safe and help you avoid any muscle pulling and trauma. AMOSTING is a sports gear and kids toy brand which offers a variety of athletic gear and different toys for kids. One of their most popular products is these best knee sleeves for basketball that can be used for many different purposes. They are great for athletes from all age groups, from youngsters to adults. Many NBA basketball players have acknowledged the AMOSTING knee pads and have stated that they are a favorite choice among their friends as well. They are so popular because these best basketball knee pads are not only providing protection against impacts, but they are also providing compression that knee sleeves provide. They are sold in pairs, which is cheaper than when companies sell knee pads or sleeves separately. 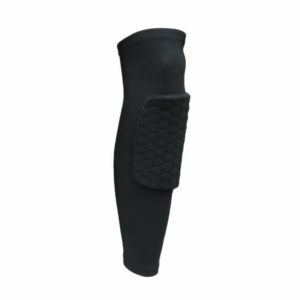 The materials used in the production of these sleeves are elastic polyester fiber, making the knee sleeves durable, comfortable and breathable, as the polyester fiber material is high-quality resistant to rips, tears, and abrasion, yet ensures that your knee pads fit perfectly to your knees. The honeycomb knee padding technology, which has become highly popular in recent years, makes sure that your knees are protected from all sides and reduces the possibility of bumps and bruises. The padding itself is made out of EVA foam, which is elastic, but at the same time very tough material. And overall there are three different sizes available, as provided in the size chart below. There are many benefits to the AMOSTING basketball knee pads. The extended length of these pads protects not only the knee but also tights and large part of your leg from scratches and bruises. There is an anti-slip silicone band which ensures that your knee pads stay in place during activities. The material is tight-fitting and has a compression effect, but the pads are still breathable, keeping your knees at the right temperature. Also, these knee pads not only protect your knees from different impacts, but also from UV rays. So you can wear them throughout summer time and also in the winter. And, as you all know, sports gear and accessories can get really stinky with time, but thanks to the breathable fabric of the AMOSTING knee pads your pads will say clean and nice smelling for longer. When deciding on the right size, you should consider the fact that these knee sleeves are flexible and will provide compression when you wear them. So when ordering, you should consider how tightly fitting you would like your knee pads to be. If you would like a snug fit then order exact sizes, but if you prefer a much looser fit, then consider ordering a size up. The already mentioned company Coolomg manufactures many different athletic gear and accessories, including these long basketball knee sleeves. They are made out of soft and elastic polyester material which is comfortable and at the same time durable. The Coolomg special ink technology, uses an environmental Italian Ink, which is safe and soft on your skin and does not fade after washing it. It is important especially because these knee pads are machine washable and dryable. Although the Coolomg basketball knee brace is marketed as basketball accessory, it can also be used for other sports and activities, like football and running, and any outdoor activity, including gardening. These knee Coolomg basketball knee braces are so effective and popular because they increase your blood flow and circulation throughout your knees, reducing pain and reducing the possibility of getting a muscle injuries. But, even though these knee pads do provide pain relief, you should still be very careful after serious injuries and trauma, as you shouldn’t overburden your knees with a lot of activities even if they are feeling good. All in all, there are many different knee pads, sleeves, and braces intended for basketball players. And even though they all seem quite similar, there are huge differences to all of them. They all have different lengths and sizes, there are many different materials used to make these products and different styles are offered. Some basketball knee pads and sleeves have a lot of padding but some have less and are intended to provide great compression. 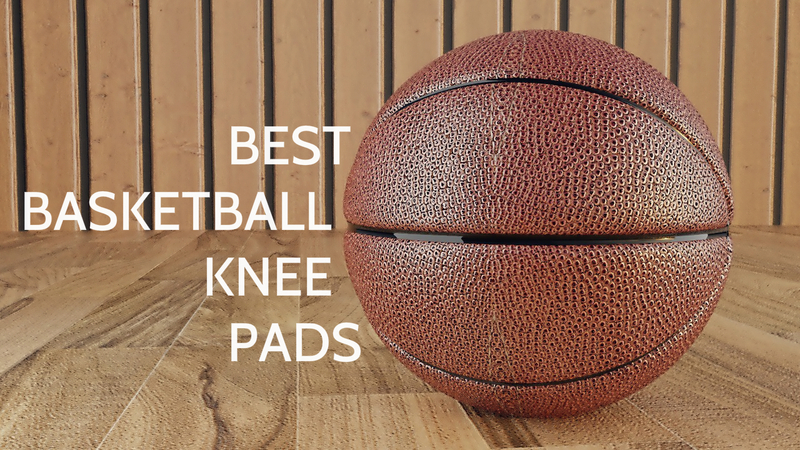 Overall, when you are deciding on the perfect basketball knee pad, you should carefully take into consideration what kind of impacts your knees are exposed to and choose enough padding for that impact. Also, you should always carefully measure your knees and then compare these measurements to the manufacturer provided measurements of each size. But, if you are looking for a knee pad which is going to be appropriate for playing basketball, any of the above-mentioned knee sleeves will be fine if bought in the right size.